ARTIST'S PROOF (Phase 2.1) - This enhanced CD includes both audio and video cuts, and is part of an ongoing interactive CD project. Voice, harp, synth, strings, horns, tuba (oh yeah!). Songs include: Way You Are Blues, Land of You, Cosita Latina, Birth a' Bertha, Never Too Late, Dance to the Moon, Merceditas, Up at the Barn, Dance the Way You Dance. Video clips include: That Ain't Right, Way You Are Blues & Land of You. The video is playable via computer (not a DVD). WHAT'S AN "ARTIST'S PROOF" and HOW IS IT AN "INTERACTIVE" PROJECT? Film-makers have "pre-release screenings. " Broadway shows have "Out-of-Town Tryouts." How do recording artists try out their recordings before they manufacture thousands of copies of a new CD? Usually they ask their friends to listen .... but what if an artist wants a larger cross-section of response? 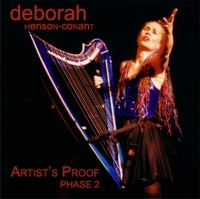 This dilemma led us to the concept of the "Artist's Proofs," private pre-releases of Deborah's upcoming 2004 CD. We've planned the "Artist's Proofs" to be released in at least three phases, each progressively more "complete." That means we're making this new CD at least three times. Until we feel we've got a CD we want to release to the national market, each version of the CD is considered an "Artist's Proof." "Artist's Proof - Phase 1," released in Sept. '03, included 8 audio cuts and 3 video cuts and a Questionnaire. Those who sent their Questionnaires back by our specified deadline received a discount on copies of "Artist's Proof - Phase 2," the upgraded version of "Artist's Proof - Phase 1" -- and their comments helped shape the changes we made in the Phase 2 CD. The comments on the Questionnaires were great -- everything from how much people loved the songs to warnings that if we included certain cuts they'd never buy the album. One person liked one of the songs so much she thought it should be the first track AND the last track. Someone else liked a different song so much he wanted an extended-play version of it. Producer Mike Dineen from Q-Division studios had great ideas for experimenting with how we mic the harp and how we edit the tunes. The diversity of response -- even on the same tunes -- was fascinating! The best part was that people's comments helped us pinpoint musical problems we sensed were there, but just couldn't put our fingers on. The most common response from "Artist's Proof - Phase 1" questionnaires was "Love the video!" We were surprised to discover that almost everyone who responded not only loved the video but had no trouble following our directions for viewing it on their computers. Interactive? You bet!! If you buy one of the "Artist's Proofs," you can consider your computer and CD player as the screening rooms for this new work. You'll get a Questionnaire with the CD so you you can become part of the Artistic Research Team, so to speak. Or you can just enjoy the CD and forget the Questionnaire. HOW'S THE 2nd DRAFT, "PHASE 2" DIFFERENT FROM "PHASE 1?" "Phase 1" was released in Sept. '03. "Phase 2" was released in late Nov. '03. In Phase 2 we added 3 new tunes, deleted one tune, made a few cuts in other tunes, went into the studio with strings and horns to enhance several of the arrangements, and added a cover and artwork which we think is a lot of fun. Phase 2, like Phase 1, is also an "enhanced CD." That means there's video footage embedded in the CD itself which you can play on your computer. We kept the same 3 video cuts since we got such a great response to them in Phase 1. For us, the creative potential of the project raised about 5 notches between Phase 1 and Phase 2, and in great part because of the feedback we got from the Phase 1 CDs. One of the basic questions we address in this project is: how do we make Deborah's CDs as powerful as her live performances? To answer that, we asked what makes live performances "work" on a level beyond her CDs? The answer was: people need to SEE her -- and she needs to know how they're responding. To get the response we ... well, we asked for it. And to let people see her ... we put video footage on the CD. HOW COME IT ISN'T JUST A DVD? We're heading in that direction, but we're not there yet. That may be our next project. But right now, we're still working on this project. The video on this CD is a couple steps above web-video -- but you still use your computer to play it, not your DVD player.